▶▶LISTEN UP! 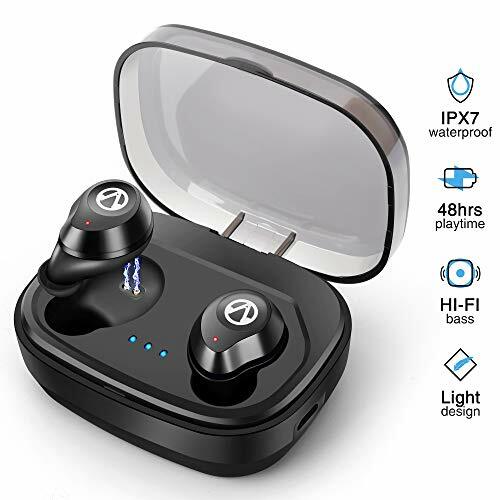 The New Edazzlia wireless headphones with Dual, 3D high-definition surround sound speakers.IPX7 waterproof, sweatproof rainproof components, and sound blocking noise cancellation technology, you’ll truly find no better Bluetooth buds on the market. 48 TOTAL HOURS LISTENING TIME - AUTOMATIC ON / OFF CHARGING(The charging case providing 16 total charges, each earbuds generating 3.5 to 4 hours of listening time)★Step 1 - Charge Por table Power case using included micro USB cable★Step 2 - Stick Earbuds into Power case. It automatically starts charge when you close the lid, and stops when your earbuds are fully charged. STAYS ULTRA-STABLE & CONNECTED - 66 FEET RANGEWalk, clean, dance, and move about the room with our long range Bluetooth headphones. you’ll experience crystal clear call quality,and crisp, strong beats, up to 66 feet from your Bluetooth compatible device. SUPERIOR COMFORT, UNRIVALED VERSATILITYEarbuds tuck snugly and comfortably into your ear, while earhook caps ensure they stay in place, without chaffing, slipping or sliding around. WIDELY COMPATIBILITYCompatible with your cell phone, iphone, Samsung Galaxy android, TV, laptop, tablet, smart watch etc. 100% SATISFACTION GUARANTEEyou’ll experience full satisfaction with your new Edazzlia wireless headphones or we’ll do whatever it takes to make it right!So go ahead, try these premium Bluetooth headphones risk free when you Click " Add To Cart "